Place value, place value, place value! Over 250 pages that are JAM-PACKED with place value fun!! 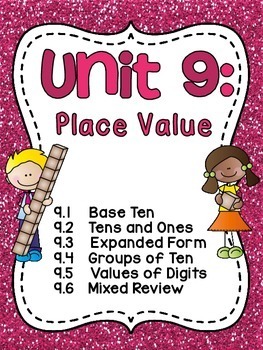 This unit is filled with everything you need to teach 6 place value standards/concepts: base ten, tens and ones, expanded form, groups of ten, values of digits, and mixed review. 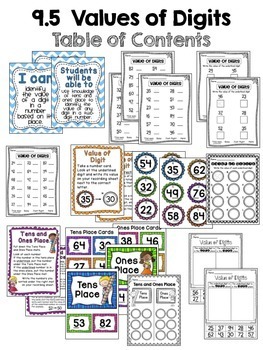 Over 100 place value worksheets, 14 centers, 16 cut and pastes, and more!! Get this in the First Grade Math Units 1-9 BUNDLE to save a ton! This unit has EVERYTHING you need to print and go to teach these place value concepts to a variety of learners - it will save you so much time! Plus, your students will be learning and having fun! 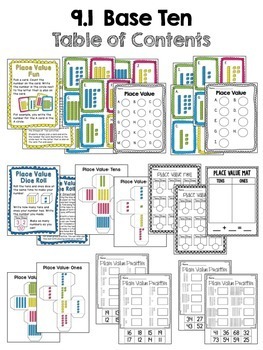 There are over 100 differentiated (all concepts have worksheets in 3 different levels) place value worksheets, 14 place value centers, 16 place value cut and paste activities, and 2 fun place value craft activities!! That is A LOT of stuff.. if I were to unbundle this, it would total over $60! I may raise the price in the future since there is just so much included but I wanted to give those of you who have purchased and loved my other math units a chance to get it for $15 like the other units I have made so far. This is easily my favorite thing I have made so far although it definitely took the longest and most work. I am really confident that you will love it! 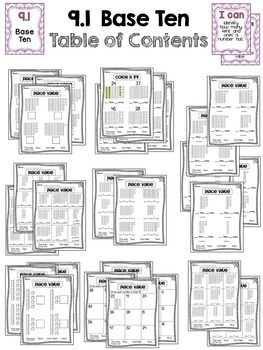 Because there are so many pages, there is a table of contents at the beginning that shows you all of the pages and you can click on the pages to get to those worksheets or activities which makes this big bundle easy to navigate! - An "I Can" student friendly poster and a "Students will be able to" poster. Some concepts in this unit have more than one set to accomodate multiple standards. - Fun and hands-on math stations that include all materials, a student-friendly guided directions page, a directions/ideas sheet for the teacher, and a recording sheet. Many of these are easily differentiated. This unit is also available in Spanish! You can currently get all of these at a deep discount in the Units 1-9 bundle! !